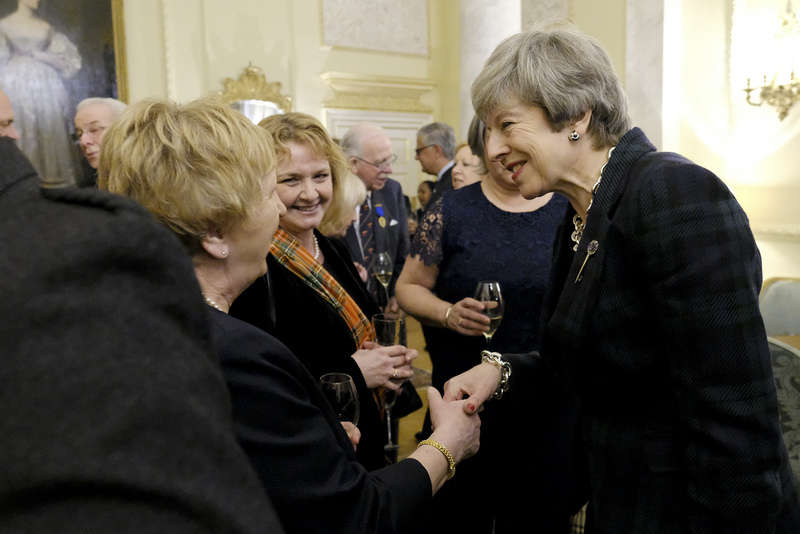 So it has been extremely chilly of late in the UK, and I, like the Prime Minister, have been navigating towards some seriously oversized scarves to keep warm! Mrs May added a new scarf to her mix this week - and one which we absolutely love. 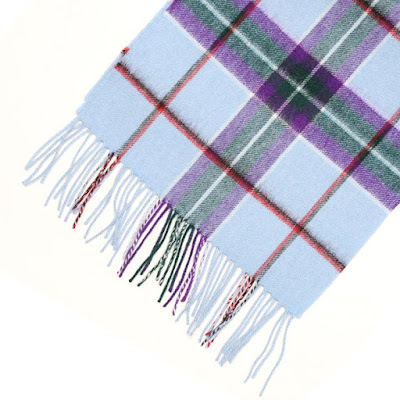 The PM has donned a cashmere scarf in World Peace Tartan - the perfect pairing with her light blue Herno coat. The World Peace Tartan was created to promote a global message of peace. The light blue represents the presence, hope and potential of the United Nations. Scotland is symbolized by the purple and green of the Scottish thistle. The red and black are reminders of the realities of war and violence and the great need for new living culture of non-violence. The white running through the pattern provides a counterbalance by peace and light. There are many different options to buy online, but this one is the closest match we have found. January is a dull, dreary month, and there's nothing like a nice new purchase to brighten the mood! The PM has done just that, stepping out in some cool new pieces over the past few weeks. Perhaps our favourite new purchase is the PM's baby blue Herno coat. Now, whilst sharp eyed readers will know this is not the first Herno coat that May owns, this one is quite different to the others thanks to its amazing colour. Herno's athleisure inspired outerwear are perfect for keeping warm in the unpredictable British weather, and with the quilted sleeves and body able to be zipped out of the coat, you are getting double for your money! 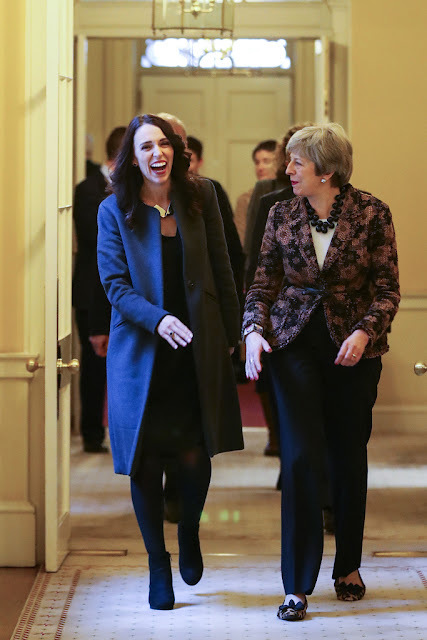 The PM has worn hers frequently since Christmas, pairing it with another new addition to her wardrobe - a greyscale patterned scarf from another favoured brand - Pazuki. We've also seen another lovely grey cashmere scarf adorned with yellow hearts - if anyone knows where this is from then please let us know! And what winter would be complete without a pair of snug, chic boots? 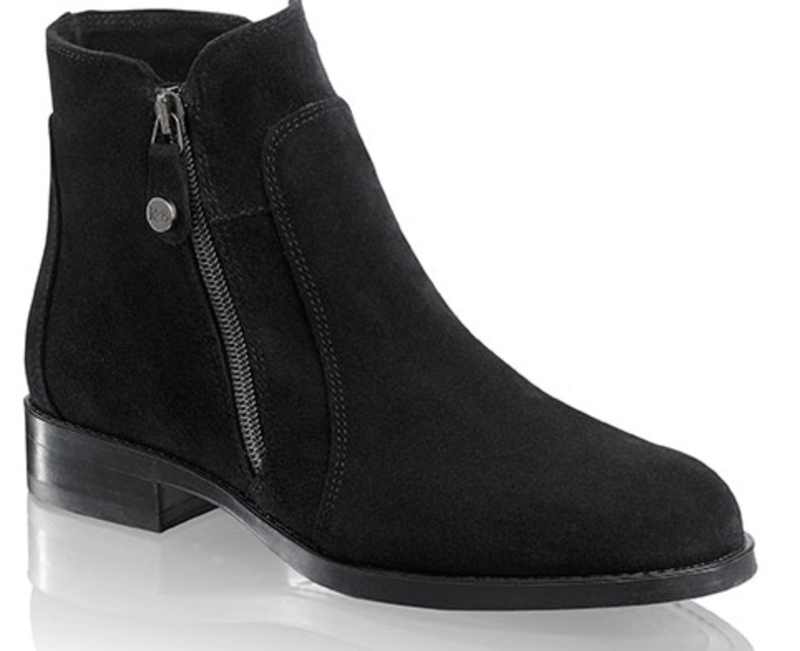 May has stepped out in this fab black suede pair from Russell & Bromley- the Tailwind is certainly a style staple! 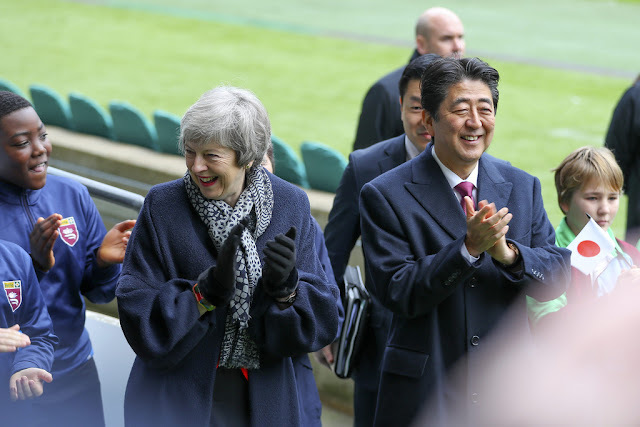 I had lots of messages about the bright, oversized necklace that Mrs May wore during the visit of her Japanese counterpart, Shinzo Abe to Number 10. The necklace is the Kadinsky Riverstones design by Jackie Brazil, whose jewellery is made from recycled resin and handmade in Brazil. Branded as wearable art, this is certainly a statement piece! From welcoming the New Zealand Prime Minister to celebrating Burns Night, here's a recap of Theresa May's week. 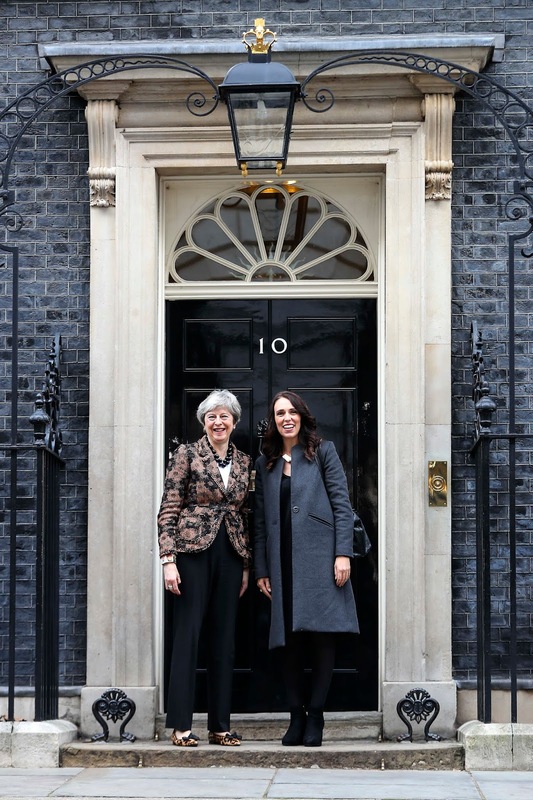 On Monday, the Prime Minister welcomed Jacinda Ardern, Prime Minister of New Zealand to Downing Street. May wore her brown Paule Ka floral tweed jacket with a pair of black trousers, her black Balls Mirta Bijoux necklace and her leopard Delicious flats from Russell & Bromley. Later in the day, May addressed the House of Commons with an update on Brexit. She kept warm on the short journey there in her new pale blue Herno coat and a black and grey scarf from Pazuki. And in the evening, the PM hosted a Burns Night supper in Number 10. The fierce Blackwatch tartan jacket from Vivienne Westwood made a welcome reappearance! On Wednesday, May took part in the weekly Prime Minister's Questions. She wore her navy fleck Military jacket from Daniel Blake, navy trousers and the navy Twiggy kitten heels from Russell & Bromley, accessorising with some sparkly Crystaldust Swarovski bangles and the oversized silver chain from Amanda Wakeley. And on Friday, the PM was in her Maidenhead constituency where she took part in the Big Garden Bird Watch, the largest wildlife survey in the world. She wore a snazzy new pink knitted scarf for the occasion! Great fun joining in this morning with children and parents for the start of this year's #BigGardenBirdWatch, in its 40th year. It is the largest garden wildlife survey in the world - and a chance for them to learn more about our beautiful British wildlife. This week was dominated by Brexit and the Meaningful Vote- as well as some strong outfits! 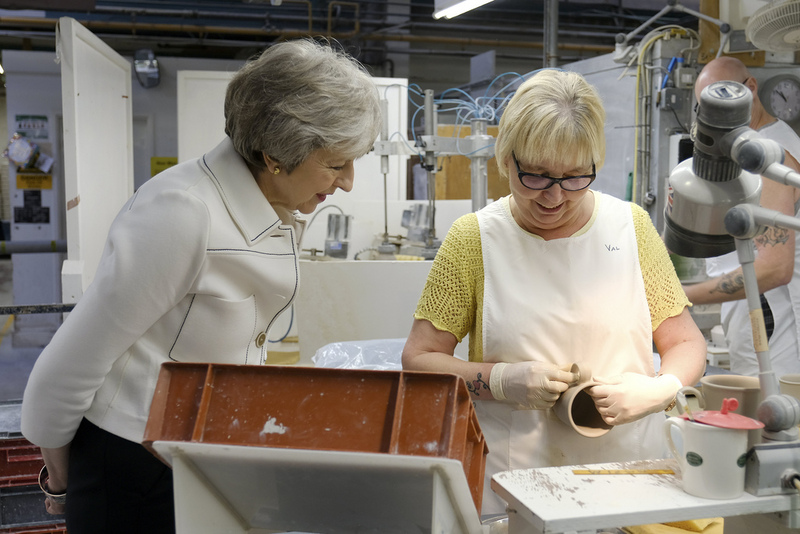 On Monday, the PM was in Stoke-on-Trent where she delivered a speech about the Brexit deal. May wore her white Piazza Sempione jacket with navy stitch detailing, teaming it with black trousers and the black Divine flats from Russell & Bromley. On Tuesday, May was in Parliament for the Meaningful Vote. She wore one of our favourite navy suits, teaming it with the navy Twiggy kitten heels from Russell & Bromley. For the chilly London day, the PM wore her navy Military coat from Daniel Blake and a soft grey cashmere scarf. 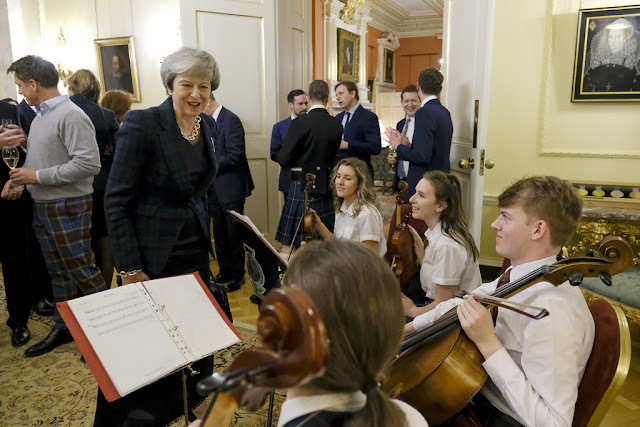 And on Wednesday, May took part in Prime Minister's Questions before the No Confidence Vote. Winning both sessions - and the style front- the PM wore her bright blue Daniel Blake Orchid jacket and matching skirt, choosing the Amanda Wakeley oversized chain necklace and bracelet and the jewelled Rosehip soft blue kitten heels from Russell & Bromley. In the evening, the PM delivered a statement outside Number 10. On Friday, the PM was photographed leaving the back of Number 10. We absolutely love her athleisure look - her new light blue Herno is the perfect coat for the chilly British weather! 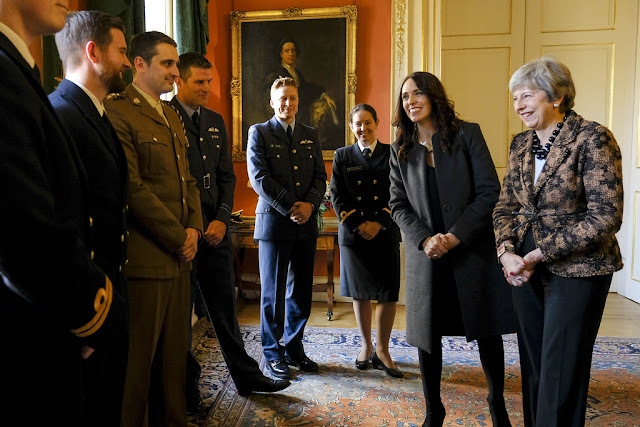 And Mrs May also has some new boots- we think they're the Tailwind black suede ankle boots from Russell & Bromley - looking cool here with ankle length trousers! It was back to Parliament for the Prime Minister and MPs following the Christmas recess. Here's what Mrs May has been up too. 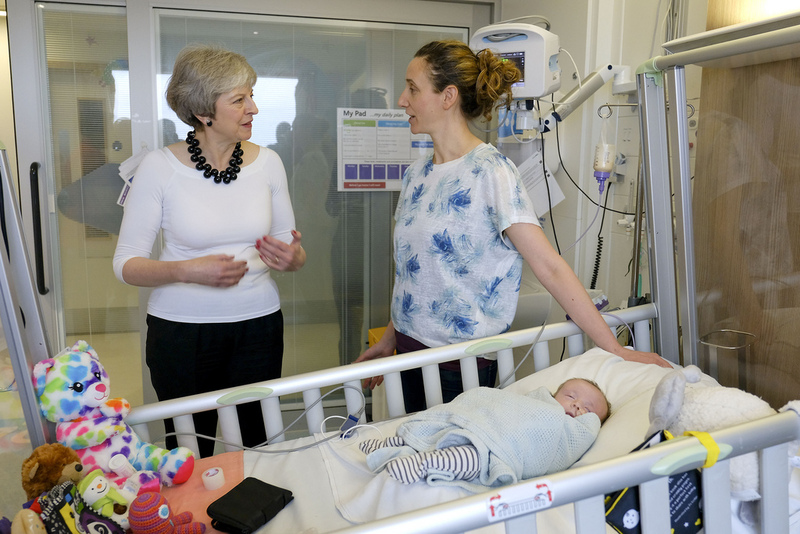 On Monday, the PM visited Alder Hay Children's Hospital in Liverpool to announce and launch the Long Term Plan for the NHS. May wore black trousers and her new tweed Paule Ka jacket, accessorising with the black Mirta Bijoux Balls necklace and her leopard Kitty heels from Charlotte Olympia. On Tuesday, the PM held her weekly Cabinet meeting at Downing Street and further meetings in Parliament. May wore her navy blue check Daniel Blake dress - here's a secret snap! And on Wednesday, it was back to Prime Minister's Questions. May wore her tried and trusted navy Escada skirt suit, accessorising with a red oversized jewel necklace and the Cocktail navy kitten heels from Russell & Bromley. 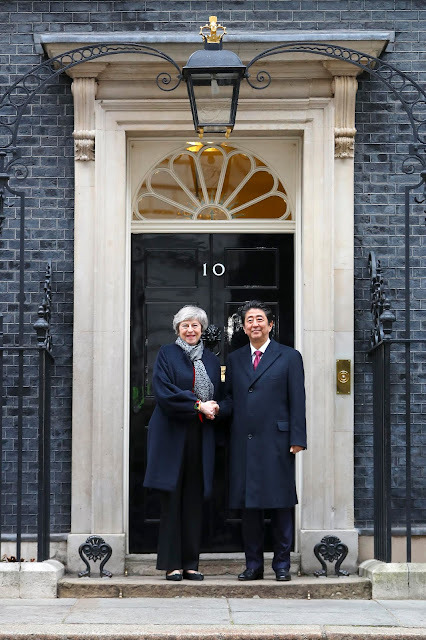 On Thursday, the PM welcomed her Japanese counterpart, Shinzo Abe to Number 10. They also visited Twickenham to mark the Rugby World Cup taking place later this year. May kept warm in her navy Amanda Wakeley coat (with snazzy balloon sleeves,) and her orange jacket from Daniel Blake. The Divine flats from Russell & Bromley made their first 2019 appearance!